Our School Christmas Cards project is a hugely popular project that we run throughout the months of August to December. We print hundreds of thousands of individual Christmas cards for schools throughout the UK. The children love creating designs, the parents enjoy seeing them, the PTA/School raises lots of money and we get a huge pleasure from making it all happen! Christmas cards for schools are a fantastic fundraiser – don’t miss out! It’s simple. The children draw their designs onto specially sized pieces of paper (we call drawing templates) on the back of this paper the child’s name and class will be written. The drawing templates are then returned to for scanning into our systems and for their children’s names to be recorded against their drawing. We then print a set of personalised order forms (one for each drawing) which shows the child’s drawing. The order forms are then distributed to parents for them to choose which products showing their child’s design they wish to order. Orders and money is collected by the school’s coordinator. One bulk order is then placed by the school coordinator with us to fulfil the parent’s orders. We send the final school Christmas cards to the school coordinator to distribute along with a single invoice for our products. School Christmas cards can’t get any simpler! You can read in much greater detail about our school cards project on our process and timetables page. Alternatively try out our project planning tool for your school fundraising project. ANY REQUESTS RECEIVED WILL BE HELD UNTIL 2019. Just fill in your details to request a free information pack by post. Our information packs contain everything you need to understand exactly how running a Christmas card project with DigiPrint Graphics works. It also contains samples of our cards and gifts tags, so you can see first hand the quality of our products. How much money does the School make? Our prices are set as competively as we can to allow schools to make a healthy profit from this fun artwork project. Our Christmas cards for schools are priced between £3.00 and at £3.30 per pack of 12 cards (depending upon how early you order). The price at which you charge parents is determined entirely by you. However a popular price is around £5 per pack of cards. At this price, this creates a profit of between £1.70 and £2.00 per pack for the PTA/School. 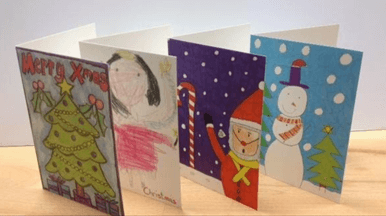 An average school of around 300 children can easily make a profit of over £400 on a school Christmas card project, which is why they are so popular. Why not use our interactive profit calculator to see how much your school could raise? 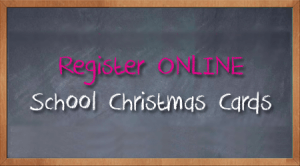 Do you print JUST Christmas cards for schools? No, in fact as part of our school “Christmas card” project we also offer self adhesive gift tags, thank you cards, value packs (a set of cards, gift tags and thank you cards). A few years ago we also introduced printed school mugs into our products range, which have proved to be hugely popular. All of our products are produced using your child’s artwork and include the child’s name as the designer. We have set out full details of all of our products and pricing on our website but if you have any questions which can’t be found on our FAQ then please just give us a call on 01296 707565. In addition to our school christmas cards we also run a series of other fund fundraising projects for schools including printed mugs for schools, fundraising school calendars and printed school raffle tickets. Remember if you are a school based in the Republic of Ireland, you can also use our services with our specially designed Christmas cards for Ireland Schools service. Don’t forgot to LIKE our Facebook page for news, information, special offers and more.